As I’ve tried to dissect and reassemble this whole concept of truth and beauty, I expected to discover pendulum swings happening between the culture and the church (which I did) I intended to find opposing views within the church on how we should proceed forward (which I did) and I thought I might discover some delightful way in which truth and beauty are meant to work together, in harmony (which I did); but what I did not expect was to uncover the pendulum was swinging in my own mind, or how much my soul was divided on how I ought to proceed forward, or the depth and delight in the invitation Jesus was extending to me as I attempted to answer questions about truth and beauty, the value of each within the kingdom of God and just how they are intended to work together. And I finally realized that this concept of truth and beauty is also profoundly personal—to all of us. For we are all created in the image of God, we are created beings, formed and sculpted by a master artist who structures with truth and stuns with beauty. Each of us, in our souls know what its like to be convicted by truth and compelled by beauty. And in response to the creative and restorative work of Christ in our lives, we must live by the truth of God’s word and manifest this truth in actual knowable beauty, in the action of our mission, in the message and aesthetic of our creative work, and in the character of our personhood. 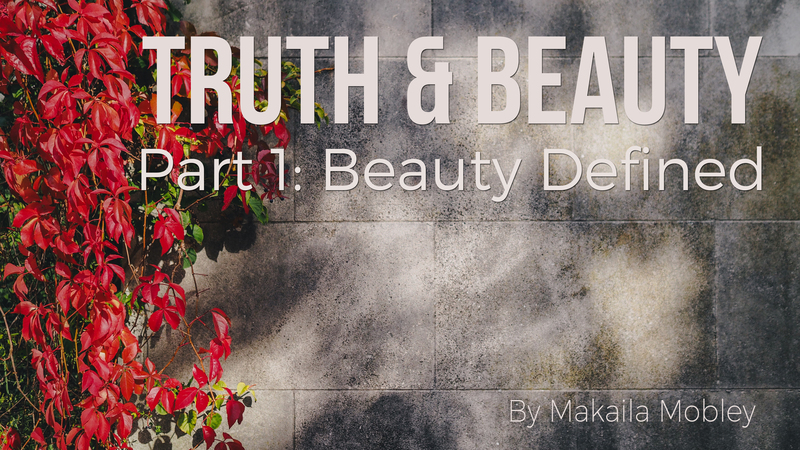 Our focus in today’s article will be primarily on defining beauty. And why is it necessary to define beauty as we ask what is the value of beauty in the Kingdom of God. I believe a definition is needed because relativism snuck in the back door while we were protecting truth and stole beauty from us, turning it into nothing more than personal preference devoid of any consistent standard, essence, or meaning. The word beauty can be used in many ways, even scripture uses it in various contexts to mean different things, sometimes its referred to as something fleeting and vain, other times scripture informs us and calls us into things of imperishable beauty. Beauty is an aesthetic, of course, but can it be more than that? And should we seek to create things of beauty, not just in message, but in aesthetic as well? To understand beauty in the best possible sense of the word, perhaps we ought to look at what the interplay between truth and beauty can be. Truth and beauty have become something of opposing counterparts that, for those of us who are consciously trying to reunite the arts and apologetics, can at times feel like we are trying to force opposing sides of two magnets together. We know intuitively that art and beauty, and communicating with a well-crafted aesthetic ought to be apart of the way we communicate the Gospel, but in order for our theology of beauty to become truly integrated into our understanding of the Gospel, we have to fill in some gaps created by the post-modern world we live in. First, its important to consider that truth and beauty were never meant to be separated into such dueling entities. They are in fact meant to be harmonious, interdependent notes in the same melody… or perhaps, more accurately, truth is the framework, the notes composed on the page, telling the musicians what and when to play, and the melody that is born from this structure is the beauty. Perhaps the relationship can be defined succinctly this way: Beauty is truth realized. And if we don’t value beauty in the church, then we are stuck on rule and principle without actually experiencing and expressing the truth in any real way. As a friend of mine has said, “everything that is reflective of God’s truth is beautiful” not just in theory for words contemplated and discussed can be richly good and well-meaning but if those words are never birthed into reality, if we never get to experience the beauty of truth lived out, then we are nothing more than a clanging cymbal or a noisy gong. Truth is beautiful and Beauty is truthful because both in their pure, un-subverted, undefiled form are glimpses into God’s mind and can be known by his love for he is the creator and source of both. The word beauty covers a spectrum of action from art to service, but in every case, true beauty must pulse with love—God’s love. Love for God and love from God. It is in knowing God’s love that we become conduits of it as we walk in truth beautifully. We long for beauty, true objective beauty, because we long for God. And we long to engage in, experience and create beauty because of that echo of the voice that called us into being. It is a longing for God and for our own restoration back into our original created state. I have found this correlation in scripture between the idea of good and that of beauty. That which God says is good is always beautiful in some form. I have for a long time been fascinated with the greek work “kalos” translated into our english word “good” in Galatians 6:9 “do not grow weary of doing good…” the word “kalos” used here caries with it the idea of “beautiful, handsome, excellent, eminent, choice, surpassing, precious, useful, suitable, commendable, and admirable.”5 This not only expands my understanding of good from performance to essence, but it deepens my understanding of the value of beauty in the Kingdom of God. Consider also what God says is good in his creation. That declaration, “it is good” after each element and creature is spoken into existence.6 This was a declaration of beauty, not only in appearance, but in essence, in meaning, in wholeness. It was good because it was not broken. And it is through the work of Christ that we can be good again, not good in a try harder, perform better sense, but good in that the essence of the thing is beautiful. We see in Ephesians 4:22-24 a profound statement of restoration, echoing God’s original declaration of his creation of man, it is a reminder to continue living out of the restoration that Christ has brought us as the Spirit empowers us to live beautifully in the truth, “put on the new self, created after the likeness of God in true righteousness and holiness” (ESV). Here we have not only the picture of what beauty looks like as original and restored creation, but we also see this reminder that we are created by God. There is an emphasis of God as builder and artist. Ephesians 2:10 beseeches us as created beings to multiply this goodness and beauty and create, patterning ourselves after our creator, “For we are his workmanship, created in Christ Jesus for good works, which God prepared beforehand, that we should walk in them” (ESV). This, undoubtedly is beauty. Not a rejection of aesthetic, but something so much deeper than sound or appearance or power. At the heart of beauty whether your aim is service or storytelling, a song, a painting, or a relationship, to create a thing of beauty, to manifest the truth in our lives, we must dive deep into the love of God, to be loved and to love. This is how we become conduits of God’s truth and beauty to the world around us.